New York Fashion Week Men’s was short and sweet for me. Two days only, I attended shows and presentations and none were any less of a disappointment. Each designer had their own unique aesthetic, which made their collections stand out in an impeccable way. I amassed a compilation of a few looks from each designer during NYFW SS19. Scroll down to read the inspirations for each collection. “The collection reflects some original prints to enrich the message of my proposal, with another object of inspiration being the creation of my own urban icons, that I interpret as the street Olympics and the lifestyle today.” The Ricardo Seco SS19 collection is composed of street, sport, urban silhouettes, that when mixed show a positive and sophisticated man without fear of saying and doing what he feels, highlighting this style without excess, and reflecting an attitude empowered by his awareness of being in this world, in a responsible way. The 25 look menswear collection is a return the brand’s early heritage of a clean, architectural silhouette, crisp tailoring in a bold color palette. “I continually return to the heritage and DNA of my brand: expert hand tailoring with the clean, architectural lines and silhouettes that have been the benchmarks of the Carlos Campos collection.” For SS19 Campos partnered with emerging menswear jewelry designer, Felipe Sena of Sena New York. Sena New York’s sterling silver, 18k vermeil “industrial chic” rings, bracelet, and necklaces were featured on several of the models. Reebok sponsored the sneakers. Victor Li’s debut collection, S/S19, features two patterns created from illustrations of the designers’ faces, hand-drawn by Victor. Signature silhouettes include elevated tees, casual jackets and modern suiting in fresh cuts, finished with idiosyncratic details and crafted for the customer who craves a smart yet easygoing alternative to streetwear. Thoughtfully made in New York from Italian, Japanese and French fabrics, VICTOR LI is designed by and for the new breed of gentlemen. Maverick designer Nick Graham, presented his Spring/Summer 2019 collection titled, “1969”. 1969 was one of most transformational years in our history, a year that had not only the first landing on the Moon by Apollo 11 and hosted Woodstock, both pretty pivotal events in our culture,” Graham said. 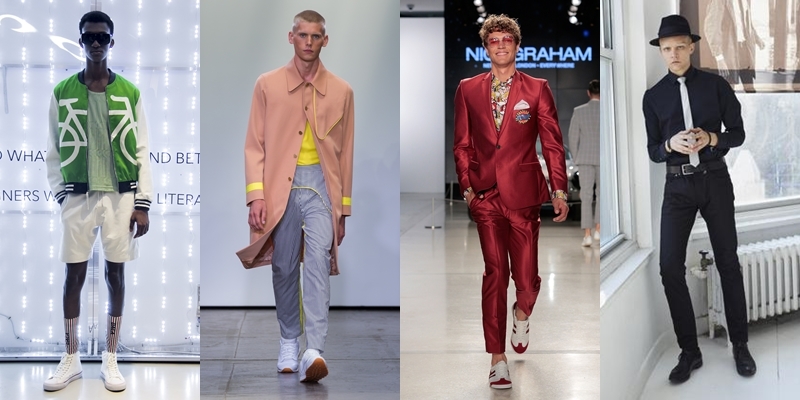 The collection was inspired by many “1969” moments with models dressed in astronaut inspired bomber jackets, commander pants, and what Graham calls “space suits,” tailored clothing with updated trims for intergalactic journeys. Katie Golinczak‘s vision is to create contemporary, seasonless, essential denim pieces designed for comfort, durability, and timelessness. She believes that denim is an ageless material that transcends generations and plays a significant role in every man’s lifestyle. Her debut collection for Spring/Summer 2019 is influenced by merging the opposing sensibilities of the Mods and the Rockers of London, Savile Row tailoring and motorcycle performance wear. The brand’s name SWONNE is derived from the London’s postcode “SW1” or “SW-ONE” where Katie grew up. I have nothing against younger models because I was once young. I am very disappointed in mens fashion week this year. I am a model over 50 years old and I also represent the big and tall collection. I went to several castings and wasn’t pick. It wasn’t because I couldn’t walk, I am sure they didn’t have my size and wasn’t thinking of someone with my build or age. I have been a advocate for both categories and have been bring attention to both advertising agencies and designers that we spend money, we are willing to spend money to look good,we are stable in our life and money is a problem. We are also visual , if we don’t see someone similar to us we cant relate to the out fit . Please try to have more diversity in your shows if you are trying to sell outfits.